Like other pheasants, the silver pheasant was placed in the genus Phasianus when described by Linnaeus in 1758. Since then it – or at least some of the subspecies associated with it – have been placed either in Euplocamus or Gennceus. Today all major authorities place the silver pheasant in Lophura. The silver pheasant is closely related to the kalij pheasant and the two are known to hybridize. 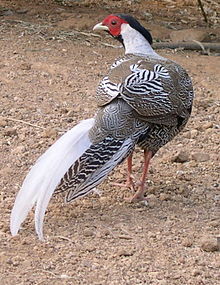 The placement of the taxa lineata and crawfurdi has been a matter of dispute, with some treating them as subspecies of the kalij pheasant and others as subspecies of the silver pheasant. They have greyish legs as in the kalij pheasant, but their plumage is closer to that of some subspecies of the silver pheasant. Additionally, as the silver pheasant, lineata and crawfurdi are found east of the Irrawaddy River, a major zoogeographic barrier, while all other subspecies of the kalij pheasant are found west of the river (oatesi, a subspecies of the kalij pheasant, has sometimes been reported as occurring east of that river, but this is incorrect). 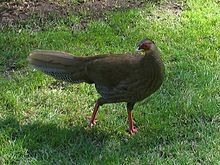 Based on mtDNA, it was recently confirmed that lineata and crawfurdi should be regarded as subspecies of the kalij pheasant. With these two as subspecies of the kalij pheasant, the silver pheasant has 15 subspecies. However, while some subspecies are relatively distinctive, several others (at least rufipes, occidentalis, ripponi, jonesi, beaulieui, nycthemera and fokiensis) are likely part of a cline, which, if confirmed, would result in them being junior synonyms of the nominate subspecies. Several other taxa, for example andersoni, are now considered invalid by all major authorities. Once considered a very rare species, the imperial pheasant is actually a naturally occurring hybrid between the silver pheasant and the Vietnamese pheasant. This is a relatively large pheasant, with males of the largest subspecies having a total length of 120 to 125 cm (47 to 49 in), including a tail of up to 75 cm (30 in), while the males of the smallest subspecies barely reach 70 cm (28 in) in total length, including a tail of about 30 cm (12 in). The body mass of males can range from 1.13–2 kg (2.5–4.4 lb). Females of all subspecies are notably smaller than their respective males, with a size range of 55–90 cm (22–35 in) in total length, including a tail of 24–32 cm (9.4–12.6 in). The body mass of females can range from 1–1.3 kg (2.2–2.9 lb). Males of the northern subspecies, which are the largest, have white upperparts and tail (most feathers with some black markings), while their underparts and crest are glossy bluish-black. The males of the southern subspecies have greyer upperparts and tail with extensive black markings, making them appear far darker than the northern subspecies. The adult male plumage is reached in the second year. Females are brown and shorter-tailed than the males. Females of some subspecies have whitish underparts strongly patterned with black, and in whiteheadi this extends to the upper mantle. ^ BirdLife International (2012). "Lophura nycthemera". IUCN Red List of Threatened Species. Version 2013.2. International Union for Conservation of Nature. Retrieved 26 November 2013. ^ Hume, A. O., & C. H. T. Marshall (1879-1881). Game Birds of India, Burmah and Ceylon. ^ Finn, F. (1915). Indian Sporting Birds. ^ McGowan, P. J. K., A. L. Panchen (1994). Plumage variation and geographical distribution in the Kalij and Silver Pheasants. Bulletin of the British Ornithologists' Club. 114: 113-123. ^ Hennache, A., P. Rasmussen, V. Lucchini, S. Rimondi, & E. Randi (2003). Hybrid origin of the imperial pheasant Lophura imperialis (Delacour and Jabouille, 1924) demonstrated by morphology, hybrid experiments, and DNA analyses. Biological Journal of the Linnean Society 80(4): 573-600. Wikimedia Commons has media related to Lophura nycthemera. This page was last edited on 19 November 2018, at 17:35 (UTC).